Bart Calhoun was born and raised in Des Arc, Arkansas, where he worked on the family farm until leaving for college at Arkansas State University. 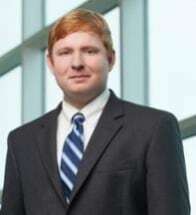 Upon graduation from Arkansas State University, he joined the Arkansas Attorney General’s office as a personal aid to then Attorney General Dustin McDaniel and a public affairs liaison. While working at the Attorney General’s office, he attended law school at the UALR William H. Bowen School of Law, where he graduated with honors and was on law review. Before co-founding McDaniel, Richardson and Calhoun, PLLC, Bart Calhoun was an Assistant Attorney General serving in the public protection department. He practiced federal and state consumer litigation and litigated in multiple bankruptcy courts throughout the United States. While at the Attorney General’s office, he worked on legislation and regularly communicated with members from the Arkansas General Assembly on matters related to the office and legislation. Since forming MRC, Calhoun has provided legal and government relations services to clients in the agriculture, construction, healthcare, medical marijuana, and banking industries. Bart Calhoun’s legal practice includes contract litigation, personal injury, collections, family law, bankruptcy, and general civil litigation. While at the Attorney General’s office, Bart Calhoun prosecuted and obtained judgments totaling over $1,000,000.00 against defendants for deceptive trade practices.